"I'd say five years is pretty wishful thinking," ... "Two years seems likely if you're going to believe statistics. 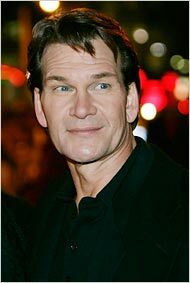 I want to last until they find a cure, which means I'd better get a fire under it"
Patrick Swayze, the balletically athletic actor who rose to stardom in the films “Dirty Dancing” and “Ghost” and whose 20-month battle with advanced pancreatic cancer drew wide attention, died Monday. He was 57. His publicist, Annett Wolf, told The Associated Press in Los Angeles that Mr. Swayze died with family at his side. Mr. Swayze’s cancer was diagnosed in January 2008. Six months after that, he had already outlived his prognosis and was filmed at an airport, smiling at photographers and calling himself, only half-facetiously, “a miracle dude.” He even went through with plans to star in “The Beast,” a new drama series for A&E, and filmed a complete season while undergoing treatment. Mr. Swayze insisted on continuing with the series. The show, on which he plays an undercover F.B.I. agent, had its premiere in January and earned him admiring reviews. A week before the series began, Mr. Swayze was the subject of a one-hour “Barbara Walters Special” on ABC, talking about his illness. “I keep my heart and my soul and my spirit open to miracles,” he told Ms. Walters. But he said he was not going to pursue every experimental treatment that came along. If he were to “spend so much time chasing staying alive,” he said, he wouldn’t be able to enjoy the time he had left. “I want to live,” he said.